5.0 out of 5 starsThis was such a sweet, short read. I loved it!! This is a very short but well written story. You get a lot of information in a few pages but it doesn't feel rushed. The characters are well developed and the story line keeps you entertained, and wanting more. Even though we only get a glimpse into their lives you connect to the characters and you relate to their situation, and can help but cheer for them. Jason is a football player who was forced into early retirement due to an injury. He moved back home with his parents while he got settle into "retirement" and made decisions on what to do with his life. Samantha has been taking care of her younger brother for the last five years. She moved back home after their mom passed away and gave up everything in her life to take care of him. Sam and Jason have been best friend for years, but as they start spending more and more time together other feelings start to surface. Both of them were afraid of how their feelings would affect their friendship and therefore tried to hide those feelings. 5.0 out of 5 starsShort, Sweet, and Satisfying! Block out 2 or 3 hours and find a cozy spot to curl up and enjoy this delightful short novel! You'll be touched by the emotional story of the widow of an Iraq war vet who finds her longtime relationship with "the boy next door" evolving into something new. The hero is the kind of football pro that most women could fall for. If you're a football fan, there's enough sports action to spark your interest. And if you aren't big on the NFL, there's just the right amount of sports action for you too -- not too much or too little, but just right. The story takes place around Thanksgiving and will warm your spirit. I don't want to spoil the plot, but I do think you'll fall for Samantha and Jason. And you'll definitely enjoy the "sweet" ending. Sam is starting to have feelings for her neighbor and longtime best friend, Jason. Jason is a newly-retired professional football player who is only home temporarily. He has only ever seen Sam as a friend, until now. 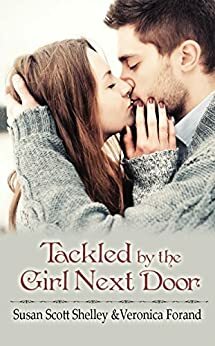 Tackled By The Girl Next Door is a good, quick read with likable characters with great chemestry. Only wish it was a full length book instead of a novella. 4.0 out of 5 starsEntertaining little short story! This was a well written love story about best friends who fall in love. He's a football player in the process of retiring due to injury and she's the widow of a man killed in the military. There are loads of reviews so I'll just recommend this wonderful short story. The H was to die for btw.